" I'm 39 year-old Boston Yankee living in Wilmington, NC, with my wife, Sara, and our 3 "furry children" (dogs). I've worked in law enforcement and the corporate and academic fields. I'm disabled now, but I have a lot of life left to live and still have the ability and desire to contribute something positive to others.
" Many moons ago, I had talked to a cigarbid.com brother who was about to be deployed with the USMC. I'd hoped to have him and a few of his buddies over for a backyard BBQ and herf before they deployed, but alas, it wasn't meant to be. Some time later, I wrote to him -- 1st Sgt. Mike Sprague -- and heard back from his wife that Mike and his troops were in the Fallujah area of Iraq. I'd been watching the news, and I had heard some of the horror stories of that area. It was not exactly a "cushy" assignment these guys were tackling.
" My father was a Marine. I say "was" only because he's no longer on this earth -- although he was a Marine to his last minutes upon it. He raised all of his kids "the Marine Corps way." That meant many things -- from bed making inspections at which time he had to be able to bounce a quarter off of our tightly made beds to the notion that the Marine Corps was a family of sorts. In my father's case (he was raised in an orphanage), it was the only family he had known until his wife and kids came along. One of the things my father imparted to me was that I was to treat every Marine as I would a member of my family, just as he had done since he ran away from the orphanage at the age of 16 to join the Corps and fight in the South Pacific during WWII. The only birthday he ever celebrated was the one listed on his official USMC record -- the one given to him by a recruiter, the one that made him eligible for the Corps. Given his love for the Corps, it's somehow appropriate that they gave him his birthday.
" Anyway, one of the things I promised my father as he was about to take leave of this world was that I would carry on as he had taught his kids to do -- if we ever encountered a Marine who needed assistance, I was to do anything and everything in my power to help out. I was more than eager to do so. I had been looking forward to joining the Corps myself right out of high school, but the bone construction of my feet would not allow that to be. If I couldn't serve IN the Corps, I could at least try to be of service to those few, those proud, who did.
" My father told me -- and in my studies this was later borne out statistically -- that men in combat who have no one "waiting for them at home" are more likely to be injured, injured more seriously and killed in action than those who are receiving "love from home." I remember 1st Sgt Sprague referring to the "young Marines" of whom he was so proud. Again, I thought of my father -- serving overseas in a hostile, foreign area, no family or friends at home sending him words of encouragement and support. I thought of my brothers and of their combat service in Viet Nam and remembered them talking about how much the letters of family and friends meant to them then.
" I knew I couldn't do much on my own. A few cigars, a few letters, but I didn't want there to be a single Marine in the 1st Sgt's company to go without the cards and letters and care packages that had meant so much to my brothers and which my father had done without. I took Mrs. Sprague's words to heart -- that those young Marines were desperate for some "love from home." Again, I knew I couldn't even make a dent on my own -- but the cbid brothers take care of their own, and I knew that if someone just got the ball rolling, we could -- together -- make a difference.
" And so Operation From The Heart (OpFTH) was born.
" At first I just asked folks to write letters -- anyone can write a letter, right? Well, of course, the folks on cbid weren't going to just send letters. Offers of cigars and snacks and "whatever they can use" started trickling in. One fella by the name of Bill Schmidt stepped up and offered to do whatever he could to help. Well, I don't know if Bill knew what he was getting himself into, but he sure got himself into it ALL the way! I have to give him mega-props for all he has done to get and keep this effort going, growing and expanding. In the beginning, I sent out packages on the first of the month, Bill on the fifteenth. I would also like to welcome aboard two more officers. Michael Ladd now sends out the first of the month shipment and covers the East Coast region. Keith Nofield is our newest officer; he covers the West while Bill covers the Midwest area. Clint, the man responsible for this spiffy site, continues to tend to it and expand it as OpFTH grows.
" Many folks generously opted to ship directly instead, thus saving on postage as well as adding to the number of packages heading out in general. One young man from a satellite campus of the U of TN got his fellow students involved in OpFTH and managed to get over 700 cards and letters and over 200 lbs. of good sent over to the 2D LAR guys. HOO-AH!!! Many others have sent packages over, large and small, and we're still at it.
" Operation From The Heart *will* contine even after our "adopted Marines" come home. We still very much need your help to keep it going. Whether it's a simple letter or a box of socks and snacks, please consider taking just a few minutes to help support the troops who have sacrificed so much. 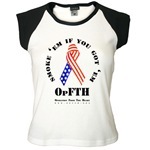 OpFTH *is* making a difference, and you can very easily be a part of it.
" Here's to all of you who have been and continue to be a part of OpFTH. Here's to the 2D LAR Marines coming home soon -- safe and victorious -- to the welcome of a grateful nation.